Benign prostatic hyperplasia (BPH) is the most common condition in ageing men, associated with lower urinary tract symptoms (LUTS). Its prevalence increases with age, and the lifetime risk of developing histologically confirmed BPH has been approximately 8% between the ages of 31 and 40 years, 50% between 51 and 60 years, 70% between 61 and 70 years and 90% between 81 and 90 years. Symptomatic (clinical) BPH is present in approximately 26% of the men in the fifth decade, 33% in the sixth decade, 41% in the seventh decade and 46% in the eighth decade of life and beyond. The enlarged gland produces LUTS complex through two routes: (a) direct bladder outlet obstruction (BOO) from enlarged tissue (static component) and (b) from increased smooth muscle tone and resistance within the enlarged gland (dynamic component). Voiding symptoms have often been attributed to BOO. Although voiding symptoms (e.g., slow stream, hesitancy, intermittency and terminal dribble) occur with a greater frequency, storage symptoms (e.g., increased daytime frequency, nocturia, urgency and urinary incontinence) are considered to be most bothersome and interfere to a great extent with daily life activities of the patient and his partner's quality of life (QOL). An observational study carried out by Oberai et al. had shown positive leads in managing the symptoms (LUTS) due to BPH with the use of constitutional/individualised homoeopathic medicine within 6 months of treatment. Another observational study by Gupta et al. had also shown similar benefits. However, a non-randomised comparative study by Hati et al. has shown some benefits with combination of organ-specific remedies along with constitutional homoeopathic medicines. The earlier told studies lagged control arm, thereby cause–effect relationship could not be established. The latter study had a comparator arm, but the major limitations of the study were sequential allocation instead of randomisation and non-significantly longer treatment period in both constitutional and organopathic medicines (BCOM) group, which could have influenced the better improvement in this group in comparison to constitutional medicine (CM) and organopathic medicine (OM) groups, which in turn brings bias to the results. Therefore, we compared the efficacy of the Homoeopathic Constitutional (HC) remedy and Homoeopathic Constitutional + Organ (HCOM) remedy against Placebo (PL). A multicentre, three-armed (HC remedy, HCOM remedy and PL), randomised PL-controlled study was conducted at five centres, namely Central Research Institute (H), Noida; Central Research Institute (H), Kottayam; Regional Research Institute (H), Gudivada; Clinical Research Unit (H), Port Blair and Clinical Research Unit (H), Tirupathi, among patients suffering from LUTS with BPH. Homoeopathic physicians with postgraduation in Homoeopathy and 15–20 years of professional experience, who consented, were involved as investigators at each centre (total 5 centres); four of these investigators had contributed in the previous observational study also. All of them were trained about the study protocol for screening, seeking informed consent, case taking, prescription and follow-up before implementation of the study. A consultant urologist was appointed for screening and assessing the cases during follow-up. The investigators filled in the International Prostate Symptom Score (IPSS) at baseline and then every month till 6 months and the WHOQOL-BREF questionnaire was filled in at baseline and at 6 months. Ultrasonography (USG) to measure the prostate volume (PV) and postvoid residual urine (PVRU), PSA and uroflowmetry was done at baseline, 3 months and 6 months. The investigations done at baseline helped in screening the patients and also in assessing the changes during the trial. Ethics Committee of the Council approved the study protocol and the study was registered in the 'Clinical Trial Registry - India': CTRI/2012/05/002649. The study was conducted from July 2012 to July 2014, wherein the patients were treated for 6 months after enrolment. The patients were screened in the outpatient departments of respective centres and as per the inclusion and exclusion criteria  and were enrolled and followed up for 6 months of the trial. Those who gave written informed consent. Patients with serious underlying medical condition such as severe renal, hepatic disease and prostatic carcinoma; complete retention of urine for >24 h; other possible causes of the symptoms such as recurrent urinary tract infection, neurogenic bladder, or urethral stricture and those interested for surgery during the next 6 months were excluded from the study. Patients fulfilling the eligibility criteria were randomised into three groups as per random numbers generated with the help of www.randomizer.org. Patients suffering from LUTS with BPH fulfilling inclusion and exclusion criteria were enrolled and randomised to HC, HCOM and PL in the ratio of 2:2:1. The site investigators were provided training before starting the study and a case report form for taking a complete history of all the enrolled patients which included protocol, case recording and follow-up forms and guidelines for conducting the trial. Soon after a patient was enrolled, case taking was undertaken by the investigators at the respective study sites followed by analysis and evaluation of the symptoms as per the homoeopathic principles, and final selection of the remedy was based on the homoeopathic Materia Medica in case of HC medicines. Organ-specific homoeopathic remedies were selected as per the recommendations of the experts. In the HC group, medicine in LM potency was prepared as follows: one globule (poppy-seed size) of the medicine in desired LM potency was dissolved in 120 ml of distilled water, containing 2.4 ml (2% v/v) of dispensing alcohol, pre-mixed in it, followed by ten uniformly forceful downward strokes given against the bottom of the phial. The patients were instructed to take three tea spoonful (15 ml) of the medicine and mixed with 8 tea spoonful (40 ml) of water taken in a glass and stirred thoroughly. Out of the above medicinal solution, one tea spoonful (5 ml) is to be taken as one dose and rest of the medicinal solution of the glass is to be discarded. The same procedure as above was followed every time for each subsequent dose. In HCOM group, along with the above individualised homoeopathic remedy, the organ-specific remedies such as Sabal serrulata (SS) ø, Hydrangea arborescens ø, Chimaphila umbellata ø, Berberis vulgaris (BV) ø, Ferrum picricum (FP) 3X, Pareira brava ø, SS ø and Solidago ø were prescribed on the basis of indications [Appendix 1]. The dosage of mother tincture was ten drops in one ounce of water/twice/per day and for trituration, 2 grains/twice/per day. PL was given in the form of globules moistened with unsuccused dispensing alcohol with 90% Vol. Primary outcome was comparison of the changes in IPSS at 6 months between the groups i.e., HC versus PL group and HCOM versus PL group and HC versus HCOM group. 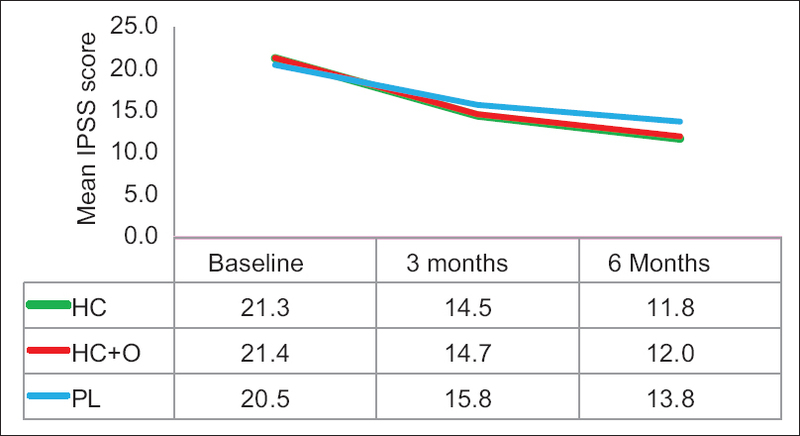 Secondary outcomes were to compare the changes in PV, PVRU, uroflowmetry (Qmax and Qavg) at 3rd month and 6th month from baseline and comparison of the changes in WHOQOL BREF at 6 months from baseline between the groups. The IPSS is an 8-question written screening tool used to screen for, rapidly diagnose, track the symptoms of and suggest management of the symptoms of BPH. Seven questions concerned to urinary symptoms (incomplete emptying, frequency, intermittency, urgency, weak stream, straining and nocturia) and one question concerned QOL. 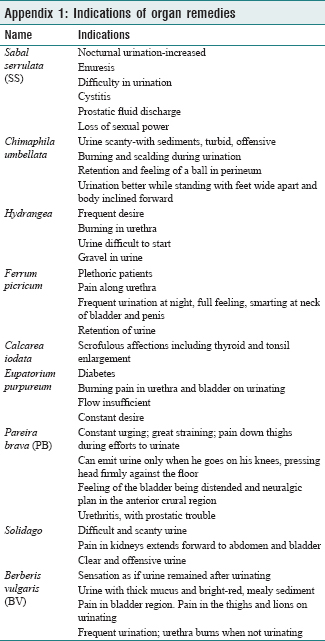 Each question concerning urinary symptoms allows the patient to choose one out of six answers indicating increasing severity of the particular symptom. The answers are assigned points from 0 to 5. The total score can therefore range from 0 to 35 (asymptomatic to very symptomatic). Further, the range is graded to mild (0–7), moderate (8–19) and severe (20–35). WHO QOL–BREF questionnaire contains 26 questions which cover four domains namely, physical, psychological, social and environmental. The answers assigned to each question ranges from 0 to 5 i.e., worse to best. The raw scores calculated for all the four domains were computed and transformed into scores (0–100 scale). The sample size was calculated keeping in view the outcome of the earlier observational study on BPH of the Council. The effect size in the previous study was found to be 0.6. Hence, in the present study, using effect size of 0.6, with power 90%, α = 0.05 and HC: HCOM: PL ratio at 2:2:1, the sample size was calculated to be 90:90:45. Hence, a total of 225 samples were required. As the trial is multicentric, for equal distribution among six centres (study withdrawn from one centre) with 10% of dropouts, the total sample size was rounded to 42 per centre i.e., 17:17: 8. Hence, a total of 252 patients were to be enrolled in the study. Reporting of the study is done as per the Consolidated Standards of Reporting Trials  guidelines and Reporting data on Homoeopathic Treatments. Statistical Package for the Social Sciences (SPSS) version 20 for Windows was used for all the data analyses. The missing values were imputed with last observation carry forward method. Patients with incomplete baseline and protocol violation were not considered under intention-to-treat analysis, thus modified intention to treat (mITT) was used. The variables with baseline difference were analysed with analysis of covariance. Values with more than two readings were analysed with repeated measures ANOVA. P < 0.05 was considered statistically significant. A total of 461 patients were screened out of which 254 were found eligible and after obtaining consent, randomised and allocated to receive one of the three interventions: HC group, n = 103; HCOM group, n = 102 and PL group, n = 49. In the HC group, one patient each did not complete the baseline and did not follow the protocol i.e., protocol violation, was excluded from the analysis. In the HCOM group, ten cases were excluded from the analysis due to protocol violation and in PL group, one case was excluded due to protocol violation. Thus, the data of 241 patients were analysed. All the patients with loss to follow-up were analysed under mITT protocol taking into consideration the last observation carry forward method. The flow of patients in the study is depicted in [Figure 1]. The patients at baseline in all the three groups were comparable except for PV which was less in the PL group. [Table 1] reflects the baseline characteristics of mITT population. The change in the IPSS score in all the three groups post-intervention at 6 months was analysed [Table 2]. The mean reduction (standard error) in IPSS at the end of month 6 from baseline was 10.4 (0.7), 10.2 (0.7) and 5.5 (0.8) in the HC, HCOM and PL groups, respectively. The difference between HC and PL was 4.9 (2.5–7.3), P = 0.0001. Similarly, the difference between HCOM and Pl was 4.7 (2.3–7.2), P = 0.0001. There was no difference between HC and HCOM groups. Thus, both the groups were equally effective in terms of managing LUTS due to BPH. The mean changes of IPSS over a period of 6 months from baseline showed a positive pattern. However, in the HC group, the changes were more prominent as compared to the other two groups [Figure 2]. On further comparing the category of intensity of symptoms as per IPSS from at the end of the treatment, it was found that in HC and HCOM groups, there was significant decrease in the number of patients in severe category, 58 and 59 at baseline to 04 and 12 at 6th month, respectively. Whereas in PL group, 12 patients remained severe at 6 months out of 25 patients at baseline [Table 3]. With regard to secondary outcome, there was no difference between the groups i.e., HC and PL for PV (0.5 [−3.9–4.9]; 95% confidence interval [CI]; P = 0.82); PVRU (−5.8 [−27.3–15.6]; 95% CI; P = 0.59); Qmax (0.2 [−3.5–4.0]; 95% CI; P = 0.89) and Qavg (−0.5 [−1.9–0.8]; 95% CI; P = 0.44). Similarly, there was no difference between the HCOM and PL groups for PV (1.3 [−3.5–6.1]; 95% CI; P = 0.58); PVRU (−10.8 [−28.1–6.3]; 95% CI; P = 0.21); Qmax (0.2 [−3.8–4.3]; 95% CI; P = 0.9) and Qavg (−0.2 [−1.3–0.8]; 95% CI; P = 0.6). Similarly, no difference was also observed between HC and HCOM [Table 2]. Trend line comparing the three groups is given at [Figure 2]. Further, in the four domains of the WHOQOL-BREF, no significant changes in the domains were found [Table 2]. The medicines prescribed to patients in LM potency in HC group ranged from 0/1-0/26. The prescription made in the HC group is as follows: Apis mellifica (n = 1), Cantharis (n = 1), Carbo veg (n = 1), Lycopodium (n = 49), Nux vomica (n = 2), Phosphorus (n = 5), Pulsatilla (n = 18), Silicea (n = 3) and Sulphur (n = 21). The medicines prescribed in HCOM group are Calcarea carbonica (CC) + SS (n = 1), CC + BV (n = 1), CC + FP (n = 1), Lycopodium + SS (n = 12), Lycopodium + BV (n = 15), Lycopodium + Chimaphila (n = 1), Lycopodium + FP (n = 3), Lycopodium + Pareira brava (PB) (n = 4), Lycopodium + Solidago (n = 1), Lycopodium + Hydrangea (n = 1), Nux vomica + FP (n = 1), Nux vomica + SS (n = 3), Nux vomica + PB (n = 1), Phosphorus + FP (n = 1), Phosphorus + Hydrangea (n = 3), Phosphorus + SS (n = 5), Phosphorus + BV (n = 1), Phosphorus + PB (n = 2), Pulsatilla + BV (n = 4), Pulsatilla + SS (n = 9), Pulsatilla + Solidago (n = 1), Sulphur + FP (n = 2), Sulphur + PB (n = 2), Sulphur + SS (n = 9), Sulphur + BV (n = 5), Sulphur + Hydrangea (n = 1), Thuja occidentalis + PB (n = 1), Thuja occidentalis + FP (n = 1). The medicines which were prescribed to more than 10 patients were further analysed statistically (HC group included Lycopodium [n = 49], Pulsatilla [n = 18], Sulphur [n = 21] and in the HCOM group, Lycopodium + BV ø [n = 15] and Lycopodium + SS ø [n = 12]). 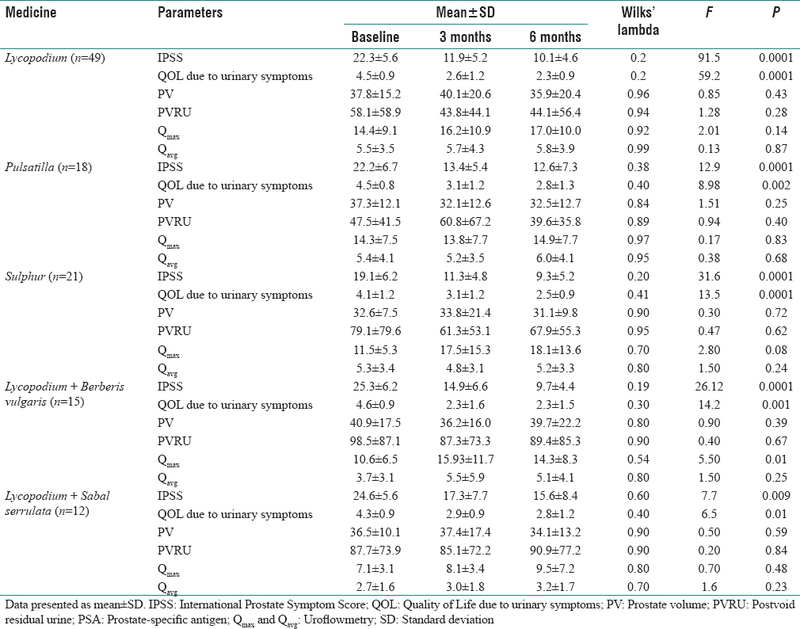 The effectiveness of these drugs in bringing the change in the various components of IPSS and the investigational parameters was assessed, and it was found that the changes were statistically significant at 3 and 6 months in IPSS and QOL with the intervention of all these medicines [Table 4]. In addition, Lycopodium has helped in bringing about significant change in Qmax values, Lycopodium + BV ø has shown statistical change in Qmax and Qavg values. This study reflects the beneficial role of homoeopathic medicines either in single or in combination with organopathic remedies in alleviating the symptoms (LUTS) due to BPH. 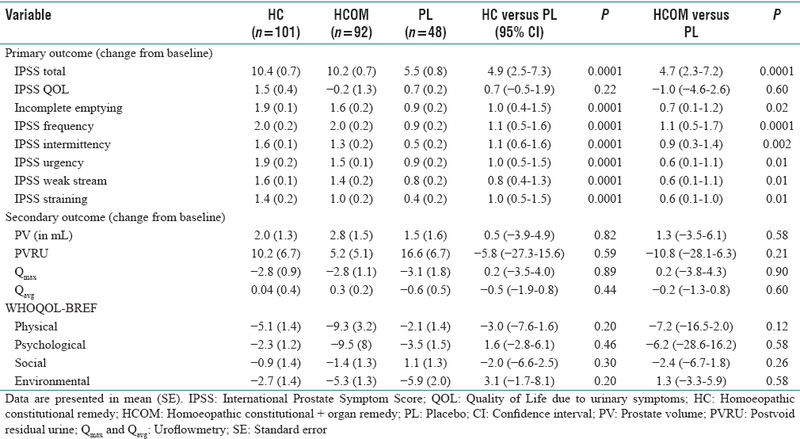 The patients with BPH who received HC/HCOM had significantly less symptom score and better functionality after 6 months of treatment than did patients who received PL. The homoeopathic literature refers to a number of constitutional as well as organopathic medicines for the treatment of BPH. Several rubrics related to the symptoms of BPH with indicated constitutional remedies and organ remedies are mentioned in many repertories.,,,, The medicines were prescribed after taking the totality of symptoms as per the homoeopathic principles. This study aimed to substantiate previous study results conducted by other researchers. One of the first observational studies validating the role of homoeopathic medicines on BPH was undertaken by Oberai et al. under the Central Council for Research in Homoeopathy considering the clinical as well as laboratory/diagnostic parameters, wherein twenty preselected homoeopathic medicines were used. This study reported that Lycopodium, Pulsatilla, Sulphur and CC in 30C and 200C potencies were found useful in alleviating the LUTS associated with BPH. However, this study was an open-label study with no limitations to the use of medicine or choice of medicine. The homoeopathic medicines prescribed in this study were in concordance with the above study. Similarly, in the study conducted by Gupta et al.,Lycopodium and Pulsatilla were the most frequently prescribed medicines. Reddy et al. published a case series of 11 patients evaluated by AUASI score  and reported Pulsatilla nigricans and Thuja occidentalis 200C to be useful in reducing the AUASI score as well as PV. Thus, a comparison among the previous studies on all such aspects will be difficult. Hati et al. used (CM) or OM alone or in combination of BCOM to evaluate their role on symptoms of BPH using AUASI score. The major limitations of the study conducted by Hati et al. were sequential allocation instead of randomisation and non-significantly longer treatment period in the BCOM group, which could have influenced the better improvement in this group in comparison to CM and OM groups. Thus, the study reported that BCOM relieved a maximum number of patients. However, the present study was conducted with randomisation and equal time period of follow-up i.e., 6 months resulted in equal effects of HC and HCOM groups. Hati et al. in their study reported 38%, 50% and 75% increase in Qmax in CM group, OM group and BCOM group, respectively, and Qavg increased by 4%, 8% and 28% in CM, OM and BCOM group, respectively, thereby increased effect in BCOM group (i.e., combination of HC and HCOM groups). However, in this study, Qmax increased by 5.1%, 0.9% and 2.8% in HC, HCOM and PL groups, respectively. Thus, the results are discordant with respect to the combined intervention. Although the changes are not statistically significant (P = 0.92), the values reflect that HC group has an upper edge in bringing the change. In the present study, the total IPSS showed statistically significant change in HC as well as HCOM group of medicines compared to PL. The comparative changes in the category of intensity in IPSS in the three groups clearly reflect that the changes found are not by chance but are due to the effect of the medicine administered. Comparing the symptoms of IPSS i.e., incomplete emptying, frequency intermittency, urgency, weak stream and straining, HC group was found to have an edge over HCOM group. In the urinary flow, Qavg and Qmax had increased, but there was no statistically significant result in HC and HCOM groups. The trials in conventional system have also shown changes in the overall IPSS but no statistically significant changes in the uroflowmetry.,,, There was no adverse event reported in the study, which further strengthens the fact that the homoeopathic intervention is safe. In all the studies discussed, the HC remedies that were prescribed most frequently and found useful are Lycopodium, Pulsatilla and Sulphur. In the other group where HCOM was prescribed, SS and BV mother tinctures were prescribed, but patients who were prescribed Lycopodium + BV ø showed changes in the uroflowmetry study as well. Further, pragmatic trial with longer follow-up and a parallel arm comprising of two groups, wherein one group had only HC drug and in the other, only organ remedy (SS/BV), may be taken up in future. A strategy may be framed to understand the potency and dosage which will help in not only relieving the symptomatology, but changes in the objective parameters may also be brought about in such cases. All the domains of Model Validity of Homoeopathic Trials  are covered in this study and are amenable to homoeopathic intervention; the specific intervention used is consistent with homoeopathic principles, the rationale for the intervention used is supported by a significant body of homoeopathic practitioners, the main outcome measures reflect the key effects expected of the intervention used and is capable of detecting the change. Furthermore, the length of the follow-up for the main outcome is appropriate to detect the intended effect of the intervention used. The overall risk of bias  appears to be minimal as only one domain (allocation concealment) out of six has high risk of bias. The primary objective i.e., comparison of IPSS, is subjective, but the secondary outcomes are objective and shall not be influenced by lack of blinding. In this study, the statistical significance is found in the IPSS in all the three groups but only in HC and not in any of the objective parameters. The limitation of the study was that it was not blinded. The inhibition for not making it blinded was the use of mother tinctures of organ-specific medicines in liquids of different colours and odours that could not be blinded. The homoeopathic principles were not compromised while prescribing the medicines in the HC group and, in the HCOM group, the organ-specific remedy was prescribed as per the homoeopathic indications only. Another shortcoming was that the duration of follow-up was also comparatively less than the other reported studies. Results of this study have shown that both HC and HCOM groups have shown symptomatic relief in patients with LUTS in BPH. The authors are thankful to Dr. Ritika Hassija Narula, Research Officer (H) for data verification of case records. Miah S, Catto J. BPH and prostate cancer risk. Indian J Urol 2014;30:214-8. Available from: https://www.clinicalkey.com/topics/urology/benignprostatic-hyperplasia.html. [Last accessed on 2014 May 30]. Reynard JM. Does anticholinergic medication have a role for men with lower urinary tract symptoms/benign prostatic hyperplasia either alone or in combination with other agents? Curr Opin Urol 2004;14:13-6. McNeal JG. The prostate gland: Morphology and pathobiology. Monogr Urol 1983;4:3-33. Lawrence TM, Stephen MJ. Current Medical Diagnosis and Treatment. 44th ed. McGraw-Hill/Appleton and Lange; New York, United States.2005. p. 925-7. Russel RC, Williams NS, Christopher BJ. Bailey and Love's Short Practice of Surgery. 24th ed. London: Ornald Publishers; 2004. p. 1377. Oberai P, Varanasi R, Ramesh D, Arya DD, Reddy GR, Sharma SK, et al. Homoeopathic medicines in the management of benign prostatic hyperplasia: A multicentric prospective observational study. Indian J Res Homoeopathy 2012;6:16-25. Gupta G, Singh JP, Tandon S, Singh S, Nayak C, Singh H, et al. Evidence based clinical study to assess the usefulness of homoeopathic medicines in patients of benign prostatic hyperplasia. Indian J Res Homoeopathy 2010;4:49-56. Hati AK, Paital B, Naik KN, Mishra AK, Chainy GB, Nanda LK, et al. Constitutional, organopathic and combined homeopathic treatment of benign prostatic hypertrophy: A clinical trial. Homeopathy 2012;101:217-23. Din KE, Koch WF, de Wildt MJ, Kiemeney LA, Debruyne FM, de la Rosette JJ, et al. 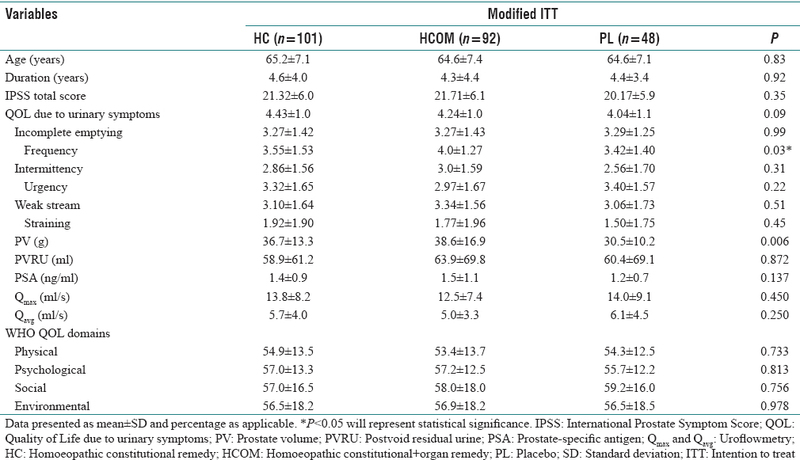 Reliability of the international prostate symptom score in the assessment of patients with lower urinary tract symptoms and/or benign prostatic hyperplasia. J Urol 1996;155:1959-64. World Health Organization. Division of Mental Health. WHOQOL-BREF: Introduction, Administration, Scoring and Generic Version of the Assessment: Field Trial Version. Geneva: World Health Organization; 1996. Available from: http://www.who.int/iris/handle/10665/63529. [Last accessed on 2012 Mar 05]. Schulz KF, Altman DG, Moher D; CONSORT Group. CONSORT 2010 statement: Updated guidelines for reporting parallel group randomized trials. Ann Intern Med 2010;152:726-32. Murphy RN. Homoeopathic Medical Repertory. New Delhi: B. Jain Publishers (P) Ltd.; 2004. p. 1246. Schroyens F. Synthesis Repertorium Syntheticum. New Delhi: B. Jain Publishers (P) Ltd.; 2005. p. 970. Knerr CB. Repertory of Hering's Guiding Symptoms of our Materia Medica. New Delhi: B. Jain Publishers (P) Ltd.; 2002. p. 625. Kent JT. Kent's Repertory of the Homoeopathic Materia Medica. New Delhi: B. Jain Publishers (P) Ltd.; 2004. p. 625. Boericke W. Boericke's New Manual of Homoeopathic Materia Medica with Repertory. New Delhi: B. Jain Publishers (P) Ltd.; 2007. p. 752. Central Council Research in Homoeopathy. Homoeopathic therapy for lower urinary tract symptoms in men with benign prostatic hyperplasia: An open randomised multicentric placebo controlled clinical trial. Indian J Res Homoeopathy 2008;8:75-80. Reddy RC, Oberai P, Singh V, Nayak C. Treating benign prostatic hyperplasia in elderly men with homoeopathy: A series of eleven cases. Indian J Res Homoeopathy 2009;4:37-41. Edwards JE, Moore RA. Finasteride in the treatment of clinical benign prostatic hyperplasia: A systematic review of randomised trials. BMC Urol 2002;2:14. Yang Y, Zhao XF, Li HZ, Wang W, Zhang Y, Xiao H, et al. 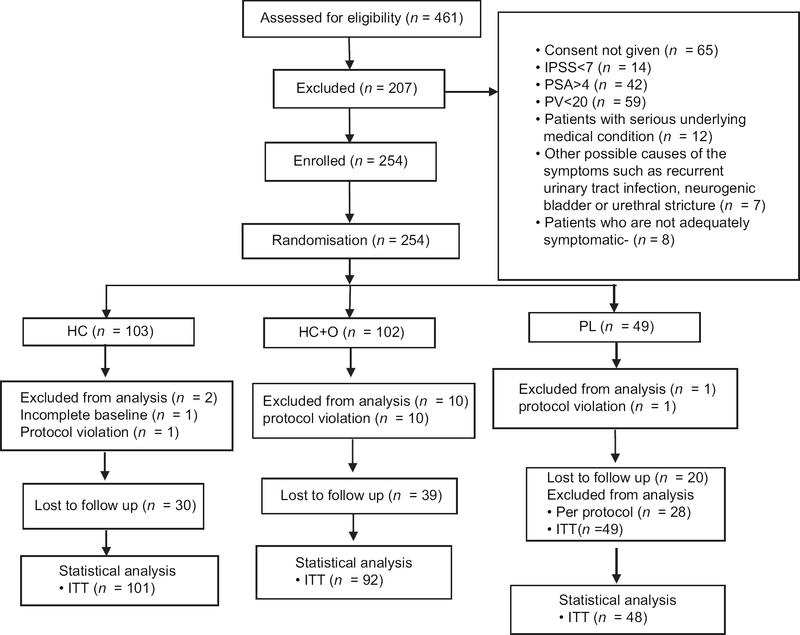 Efficacy and safety of combined therapy with terazosin and tolteradine for patients with lower urinary tract symptoms associated with benign prostatic hyperplasia: A prospective study. Chin Med J (Engl) 2007;120:370-4. Chung JH, Oh CY, Kim JH, Ha US, Kim TH, Lee SH, et al. Efficacy and safety of tamsulosin 0.4 mg single pills for treatment of Asian patients with symptomatic benign prostatic hyperplasia with lower urinary tract symptoms: A randomized, double-blind, phase 3 trial. Curr Med Res Opin 2018;12:1-9. Moon KT, Yoo TK, Kwon SY, Ha JY, Byun SS, Kim JH, et al. A randomised, placebo-controlled, multicentre, phase 2 clinical trial to evaluate the efficacy and safety of GV1001 in patients with benign prostatic hyperplasia. BJU Int 2018;122:283-92. Mathie RT, Roniger H, Van Wassenhoven M, Frye J, Jacobs J, Oberbaum M, et al. Method for appraising model validity of randomised controlled trials of homoeopathic treatment: Multi-rater concordance study. BMC Med Res Methodol 2012;12:49.